Begoña Caamaño was a highly acclaimed writer in the Galician language, author of two novels, Circe or the Pleasure of Blue (2009) and Morgana in Esmelle (2012), both recreations of myths, the first to do with the famous enchantress of Greek mythology, the second with Morgan le Fay of the Arthurian legend, King Arthur’s supernatural elder sister. This latter novel won numerous prizes when it came out, including those of the Galician Publishers’ and the Galician-Language Writers’ Associations. 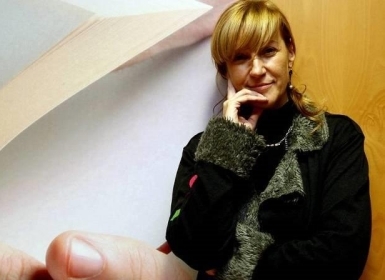 Begoña Caamaño was an experienced journalist who worked for Galician Radio, directing and presenting cultural programmes. She was also a committed feminist and contributed to numerous feminist and anti-militarist magazines. She died in 2014 at the age of fifty.